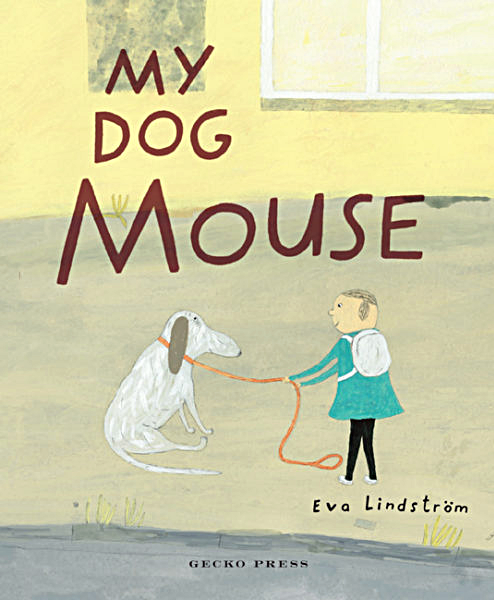 We interviewed Eva Lindström, acclaimed children's picture book illustrator and author. Her career has included painting and comic book creation as well as picture books. English translations, published by Gecko Press, include My Dog Mouse and soon to be released Everyone Walks Away. Eva has been nominated for the Swedish national award, Augustpriset, more times than any other writer in Sweden (including adult fiction and non-fiction) and won this award in 2013. She is also Sweden's 2018 nominee for the international Hans Christian Andersen Awards for illustration. The Hans Christian Andersen Award is the highest international distinction given to authors and illustrators of children's books to honor lifelong achievement and are given to an author and an illustrator whose body of work has made "an important, lasting contribution to children's literature." Eva lives and works in Stockholm, Sweden. What would you say are the most common themes in your work? A common theme is that there is something or someone that is lost. Or, a feeling of a lack of something. I think that trust and love also are themes that I work with. To have or not to have. In an interview for Bookbird: A Journal of International Children's Literature (2014) you said: "The way I see it, if my story's going to be the way I want it, I have to be my own target audience. I'm afraid that what I want to say will get diluted if I start thinking about the way anyone else, adult or child, might conceivably want to read my book." We believe this quote bears repeating. We love that statement. It has to do with the work process, I want to have fun while working. I want an intense feeling towards the text, pictures, colors and the characters in the stories. If I distract myself with what anyone else would think about the whole thing, it would only make me nervous, and the worst: perhaps be afraid that it would not be good enough. Everything in the story is in a way me, this is what I can do, take it or leave it. You do not shy away from challenging and even ambiguous content in the books you write. Do you feel adults sometimes underestimate children's ability to appreciate more complex stories? I can't say so much about that. I don't know really. There are books with complex stories and I guess that would not be the case if they were totally impossible on the market? Perhaps there's not a lot of them and that is a thing for the publishers to think about. Dare to publish them. Though you began as a painter and shifted to comic creation, you have emerged as a children's book illustrator and now author. Please tell us about your journey as an artist and writer. I have been painting and drawing since I was a child. I had a hard time at school and wanted to be somewhere else all the time, in the stable or in my room with my dear crayons. Lucky for me and a lot of others there are art schools. And then, after art school, I began writing and drawing comics. I have always been reading a lot, so writing was not far away from me. I made simple stories, often just one page to tell the whole thing. I got in contact with a publisher of picture books in the beginning of 1980. I feel that it is just now, the recent years, that I do the books that I wanted to do long ago. Now they look the way I wanted them to look then, when I began. What is next for you as a creator of books for children? Any specific projects you can share? I am working with the pictures for a book that I wrote in the spring this year. It is called Come Home, Laila. And it is (no surprise) a story about how Laila is coming home and what she is offered in order to choose to do so. The combination of watercolor, gouache and pencil drawings are compelling for your images. Do you work in other media? Oil or printmaking? I use watercolor gouache and pencil, as it is now, I love those materials, especially when they are used together with each other. No oil and printmaking right now. Do you use a computer to refine or add any color to your drawings? I do not work in the computer with my pictures. Everything is done direct on my aquarelle papers, thick ones, 300g, Arches. I often paint each motif four, five, six or eight or nine times or more, I have to be totally sure that this is it, that I cannot do it any other way. And that is a strange thing because there is always another way. But perhaps not at that moment. Was there a teacher in your childhood who encouraged your talent in art? Yes, there was a teacher. Her name is Birgitta Manners. She was my teacher for three years. She was an important person in my life, her lessons and her way of just being a kind person were so encouraging. Do you have a favorite book from childhood? Do you still have a copy? I had a lot of favorites. For example: everything by Tove Jansson, The Little Prince by Antoine de Saint-Exupery, Mio my Mio by Astrid Lindgren. I still have a copy of The Little Prince. When you are writing, how do you know when you have reached the final draft of your story? And for the art, what tells you it is finished? My story is completed when I am close to, or at the place in it where it feels like if I add something it will be overloaded. And the same thing goes for the artwork. The pictures are, in the beginning, just a diffuse thought in my head, and my work is to make them appear in a way that expresses that thought. Which comes first: the art and your sense of place or a story that you must tell? Some years ago, I used to write the text and then afterward make the pictures. Now I often make a rough sketch where the text comes at the same time as the pictures. I really don't want to have rules how to make a book, I hope I will not get too stuck with my methods. One thing is sure, and cannot be changed, the story is a diffuse cloud in my head before it comes out on a paper in whatever way. Describe how you use humor in your books and its importance to the children who read them. I am happy if the reader, the children, can find the fun things in my stories. I don't think that my humor is very obvious, it is more like it is there if you want it, if you are in the mood. The humor is from the very beginning a way for me to have fun at work. Is it always important for you to speak from the perspective of a child in your stories? There is a double thing about children's books, they are (often) read to the child by an adult. There can be two ways of receiving the message of a book. The dream is to make a story that can be appreciated regardless of age and life experience. So perhaps it is a human perspective that I want to have. Thank you, Eva, for sharing your provocative, beautiful and inspiring work. And a special thanks to Julie Danielson of children's literature blog Seven Impossible Things Before Breakfast and contributor to Kirkus Reviews. Her posts introduced us to this fine illustrator and author. All images used with permission from Eva Lindström and Gecko Press.